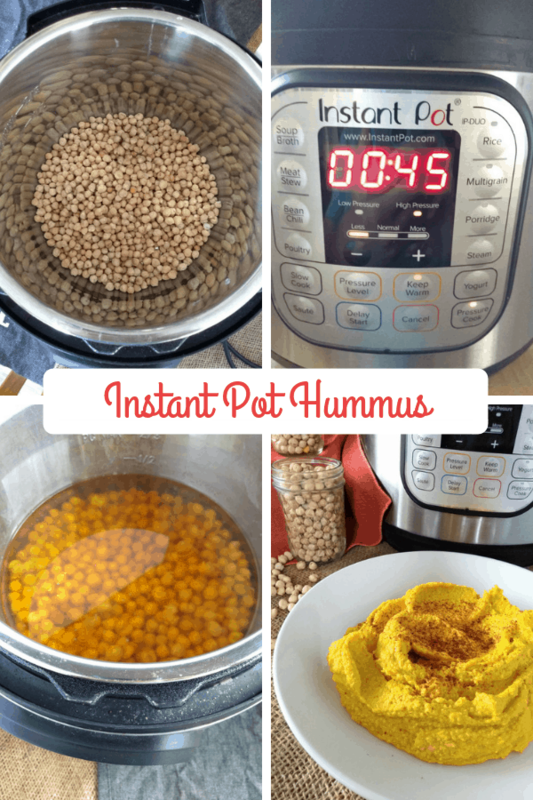 Can You Make Hummus in the Instant Pot? 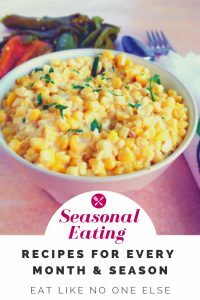 The Instant Pot can be considered a miracle maker. It can turn frozen chicken into dinner within an hour. But can it do everything? We here at Eat Like No One Else HQ are looking into all the different things that can be done in the Instant Pot. Exploring the possibilities and sharing our findings with you. Call us Instant Pot researchers! Today we are looking at hummus. 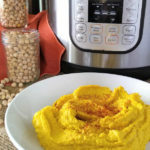 Is hummus something you can make in the Instant Pot? Here is a hint, you don’t need to rely on store bought hummus anymore! Ok so here is the deal. You don’t quite make the whole recipe in the Instant Pot. I mean you certainly could if you choose to use a stick blender or your muscles to smash up and smooth out the chickpeas. I myself prefer to dirty one more appliance and break out the food processor to get a smooth, creamy hummus. To each their own. The most vital part of hummus is the chickpeas or garbanzo bean if you will. It’s the basis for your hummus and it will only be as good as how good your chickpeas were cooked. This is where the Instant Pot becomes your best friend. You see dried chickpeas make better hummus than canned chickpeas. I find that the texture is better. It’s more velvety, rich, and delicious. Not to mention a bag of dried chickpeas is usually cheaper per ounce than a can of chickpeas. The issue with cooking dried chickpeas is takes some time. Canned chickpeas all you have to do is open the can. So I can see why people may want to go that route. 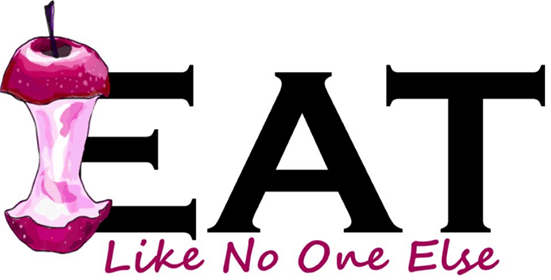 What needs to be done is we need to cut down on the cook time. In the past, I have put chickpeas in a slow cooker. That took 4 hours, not eternity, but maybe longer than most of us want to wait. 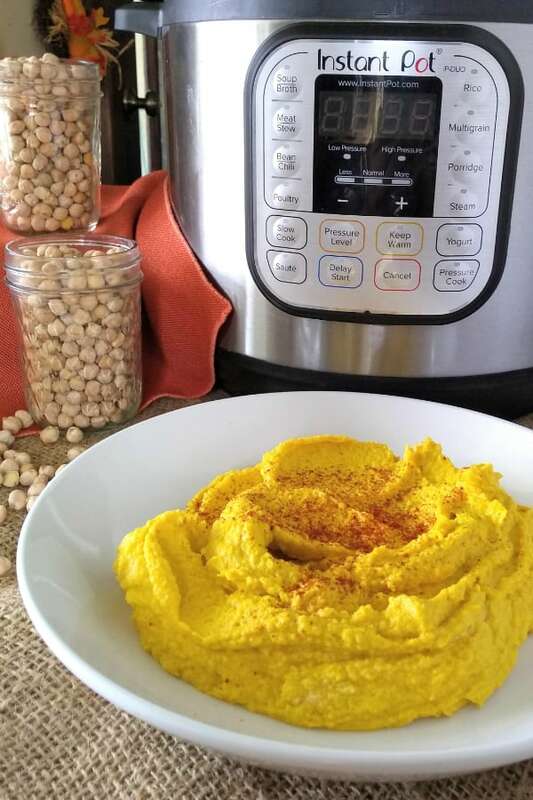 With the Instant Pot it only takes 45 minutes (plus time to come to pressure and reduce pressure) to produce perfectly cooked chickpeas. The best part is that it cooks them to a point where they are still solid enough, not mush, that you can save some of them for salads. Or even put them into the oven to roast them to make crunchy chickpeas – which could then go on your salad. 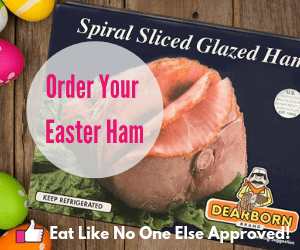 RELATED Can You Cook Ham in an Instant Pot? I started with a 1 pound of dried chickpeas. 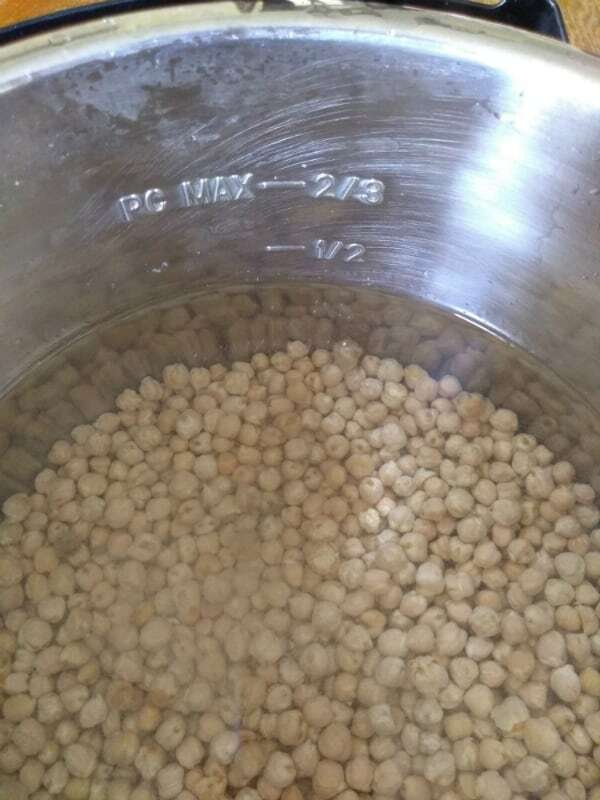 Give them a rinse and do a quick check for any little stones that might have gotten mistaken for a chickpea. I added 9 cups of water. As you can see the water is underneath the maximum fill line. That is very important. Make sure you don’t go above it. 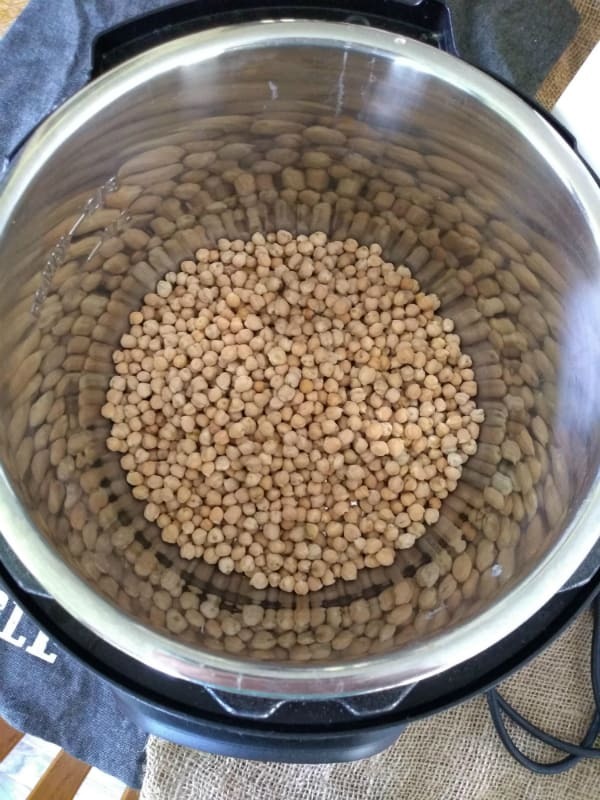 You can do less chickpeas if you want, just adjust the amount of water you are using. 1 pound of chickpeas makes a lot of cooked chickpeas. 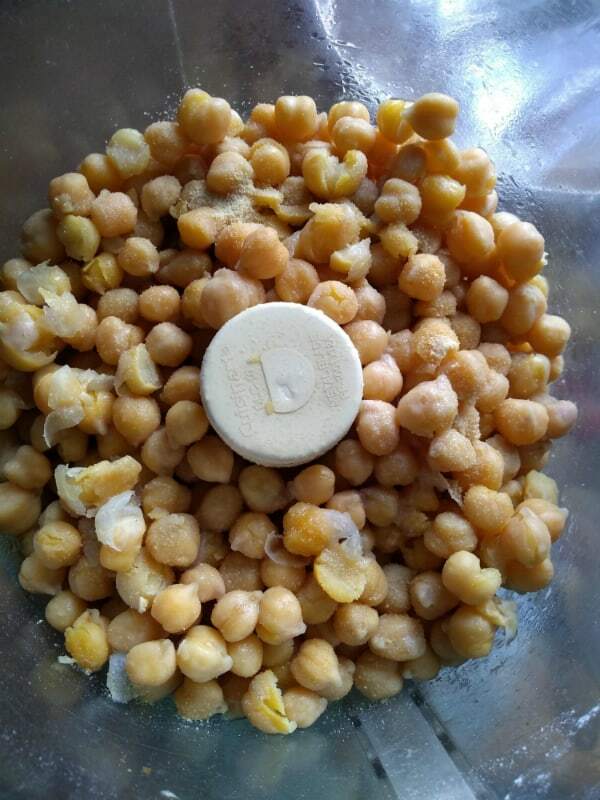 You can either make a big batch of hummus and freeze some for later or you can have extra chickpeas on hand for other things like I mentioned earlier. 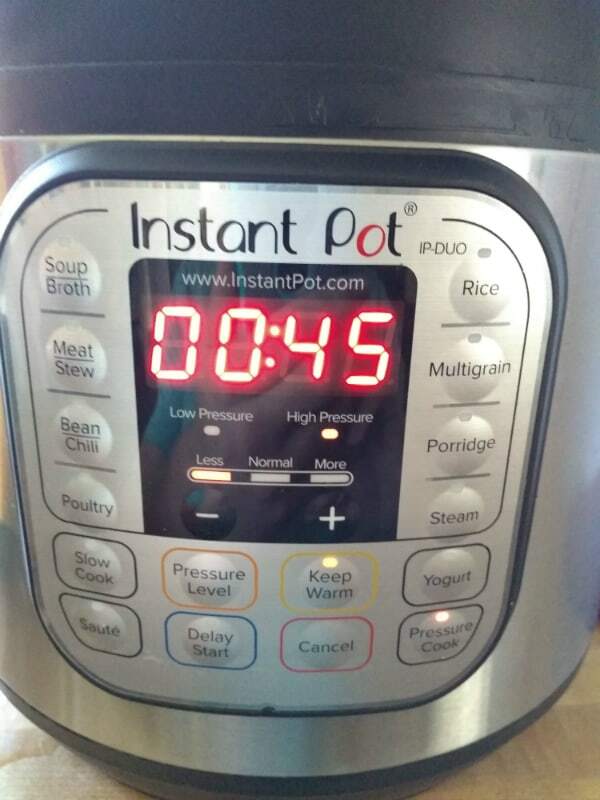 I hit the Pressure Cook button on my Instant Pot and set it to 45 minutes of High Pressure. Make sure you set your pot to sealing and let it naturally release the pressure. I don’t like manual release for something like chickpeas because you are going to throw starchy water into air. Just be patient and wait for it to de-pressurize. The chickpeas should be perfectly cooked. They aren’t mush so you can use them whole. But they are soft enough that you can puree for hummus, which is why you are here in the first place. This hummus has pumpkin in it (and some tumeric in it for added color). 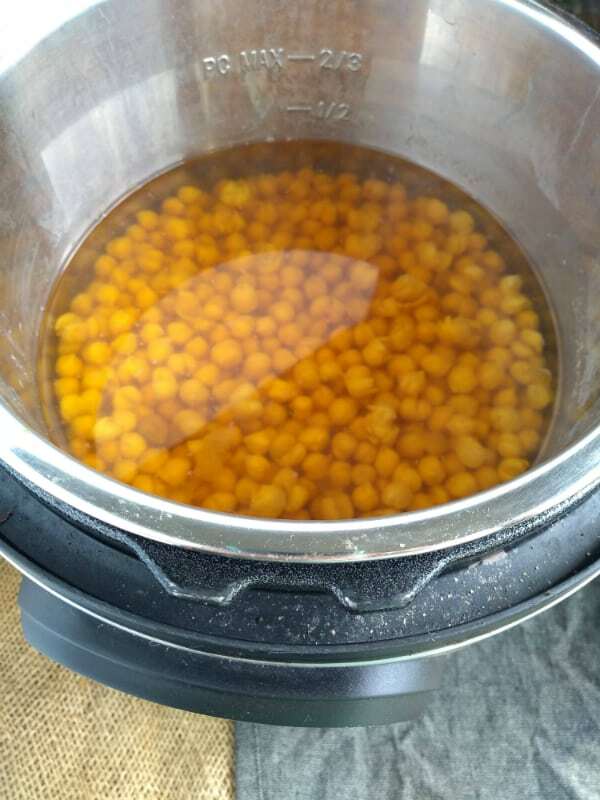 As you can see it’s pretty easy to produce the chickpeas that will be the basis for your hummus in the Instant Pot. 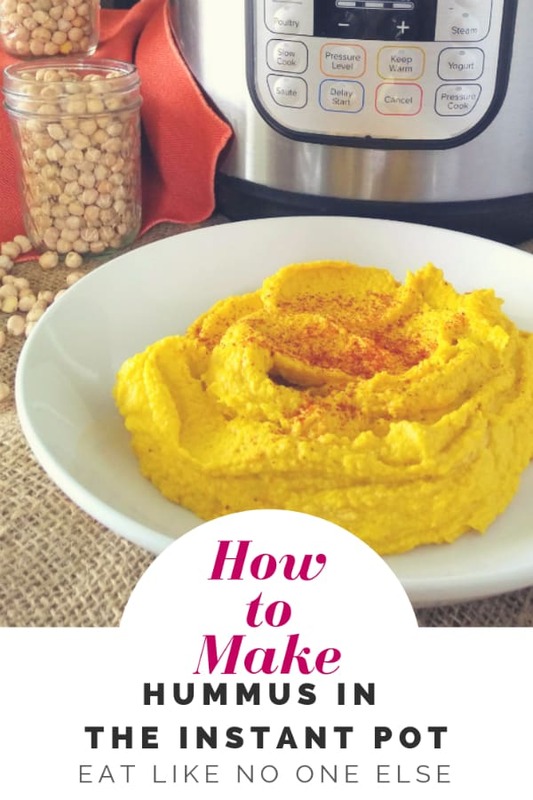 Once you have the chickpeas ready, it only takes a few minutes to put together your finished hummus and ready for some high quality snack time. Get the pita chips ready!